Complete Tote Kit includes hand-drawn three-piece pattern on Scottish Linen and hand-dyed wool in 20 colors (not pre-cut strips), for motifs in shades of red, orange, melon, blue, turquoise, gold, yellow, pink, and greens. 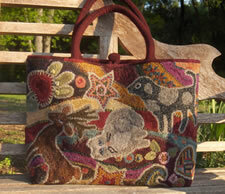 The background is a rich hand-dyed brown (as shown) and matching wool for shoulder strap/handle. Printed labels to identify wool colors, color placement “Map” for hooking, color “Finishing Brochure” of step-by-step hooking, and illustrated finishing directions, and color photographs. Lining is not included. The tote consists of 3 hooked pieces. 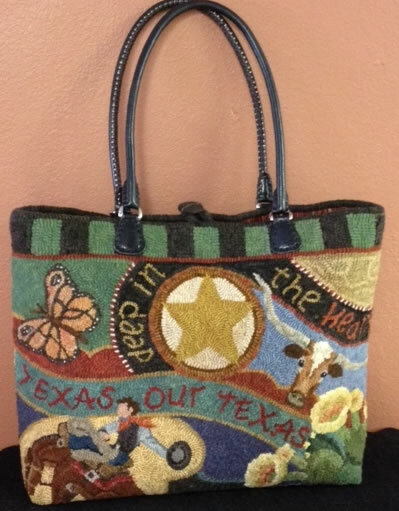 Design on each piece of tote is different. 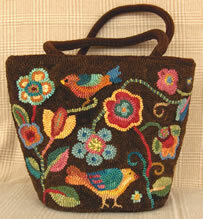 Complete Tote Kit includes hand-drawn three-piece pattern on Scottish Linen and hand-dyed wool in 30 colors (not pre-cut strips), for motifs of primitive posies, leaves, vines and bird in corals, reds, golds, teals, and greens. Background is “black-of- many-colors” (as shown). 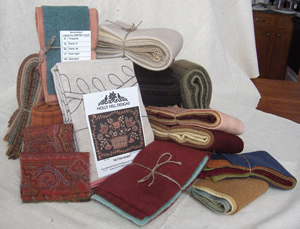 Printed labels to identify wool colors, color “Finishing Brochure” of step-by-step hooking, and illustrated finishing directions, and color photographs. Matching wool for short wool-covered handle. Lining is not included. The tote consists of 3 hooked pieces. Available in 2 sizes. 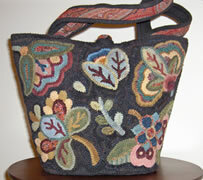 Complete Tote Kit includes hand-drawn three-piece pattern on Scottish Linen, hand-dyed wool in 30 colors for motifs and background (not pre-cut strips), printed labels to identify wool colors, color placement “Map” for hooking, color “Finishing Brochure” of step-by-step hooking and illustrated finishing directions, and detailed color photographs. 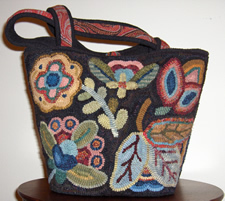 Includes background “black-of- many-colors” (as shown) and wool for shoulder strap with antique Paisley trim (included). Lining fabric is not included. 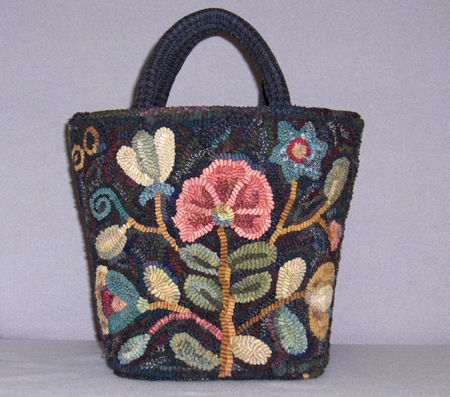 19” x 28”, a one-piece tote that folds and seams together easily with 2 long and 2 short seams. 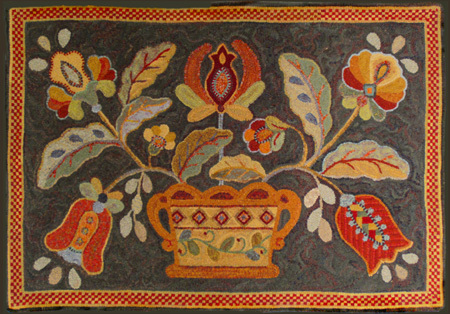 There are 14 main motifs with a “crazy-quilt-style” background design inspired by old paisley. 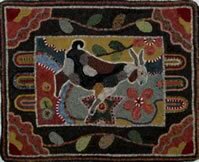 This pattern can be made into a 25” x 34” rug (instead of a tote) with the addition of a 3” border that you can easily add to the pattern; however wool for added border is NOT included in Tote Kit. Complete Tote Kit includes hand-drawn one-piece pattern on Scottish Linen, hand-dyed and as-is wool in 47 colors for motifs and background (not pre-cut strips), printed labels to identify wool colors, color placement “Map” for hooking, color “Finishing Brochure” of step-by-step hooking and illustrated finishing directions, and detailed color photographs. Lining and handle fabric is not included. Purchased handles may be used. 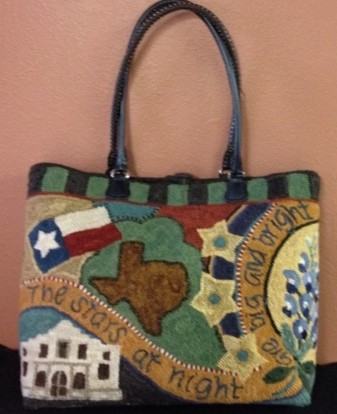 Celebrating State Symbols of Texas, the Lone Star Tote Bag is a large, classic shopper-style tote. 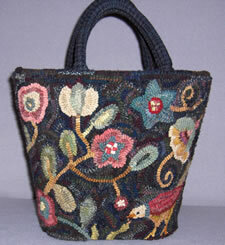 Pattern is 19” x 32”, a one-piece tote that folds and seams together easily by hand with 2 long and 2 short seams. The design on the tote is different on each side and bottom. Complete Tote Kit includes hand-drawn one-piece pattern on Scottish Linen, hand-dyed and as-is wool in 47 colors for motifs and background (not pre-cut strips), printed labels to identify wool colors. Color Instruction Brochure includes close-up color photos, detailed step-by-step hooking directions/color plan, and illustrated finishing directions. Lining and handle is not included. Leather handles, as shown, are available from Holly Hill Designs, call for details. 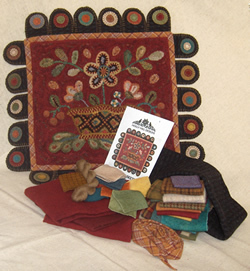 Complete Kit includes hand-drawn 20” X 20” pattern on Scottish Linen and hand-dyed and as-is wool textures in 26 colors (not pre-cut strips) for motifs in shades of greens, teals, golds, reds, and blues, as well as swatch of Antique Paisley. Background is 3 hand-dyed pale golds for soft, muted textural effect. Wool swatches are labeled to match step-by-step hooking directions, with accompanying motif close-up photos, in the 6-page Directions Brochure. Optional hooking techniques such as “2-color Beading” and “End-to-End Tunneling” are described in Brochure. #6-#7-cut strips recommended. Kit Includes: Hand-drawn 13” x 15” original design on Scottish Linen for hooking, 20 hand-dyed wool swatches and as-is texture swatches for motifs, each identified to match directions (not pre-cut strips). Hand-dyed wool for hooked background. Instruction Brochure of step-by-step hooking instructions with illustrations and 7 close-up color photos; description of hooking techniques for ‘2-Color Beading’, ‘Waldoboro sculpting’, and ‘end-to-end Tunneling’. #7-cut strips recommended. Seed Basket is 13” x 15” hooked. 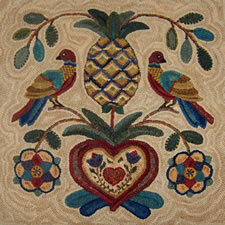 Perfect for chair pad or pillow. Hooking instructions for novelty techniques in color “Instructions Brochure”. 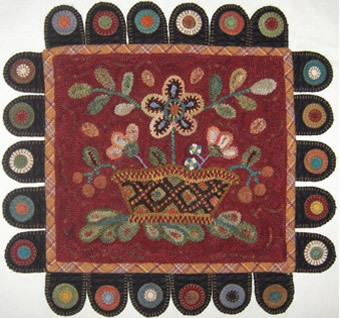 The “Seed Basket Penny Rug” is a 13” x 15” hooked mat with attached bias wool band, wool appliqué ‘“Tongues” with “Pennies & Coins” and black woolbacking. Perfect for chair pad or tabletop. Hooking instructions for novelty techniques in color “Instruction Brochure”. Hand-drawn 13” x 15” original design on Scottish Linen for hooking, 20 hand-dyed wool swatches and as-is textured swatches for motifs, each identified to match directions (not pre-cut strips); hand-dyed wool for hooked background; textured black wool for “tongues” and backing fabric; hand-dyed wool for colorful “coins” to appliqué to tongues; bias-cut & pre-sewn orange plaid wool for banding; “tongues” and “coins” templates; Medici Wool Tapestry Floss for ‘buttonhole-stitch’ appliqué; Instruction Brochure of step-by-step hooking and finishing instructions with illustrations and 7 close-up color photos; description of hooking techniques for ‘2-Color Beading’, ‘Waldoboro sculpting’, and ‘end-to-end Tunneling’. #7-cut strips recommended. Button Basket our most popular custom kitted rug, as requested by experienced rug hookers, is now available in kit as shown. This kit is complete with all materials you will need as well as “teacher in a box” instruction booklet. 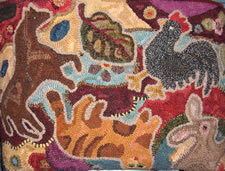 “Teacher in a box” instruction includes color organization with identification and placement for each color throughout the rug with close up color photos and step by step instructions. 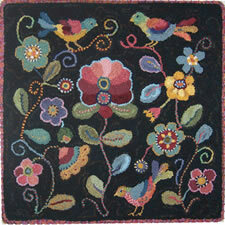 Background wool, ‘black of many colors’, is a mixture of 8 different colors of as-is and hand-dyed wools. Antique paisley compliments the approximately 100 different colors of wool (not precut into strips). 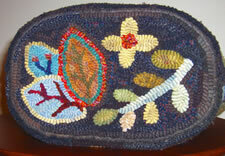 Instructions for 2 color beading, end to end tunneling, and color blending is included. 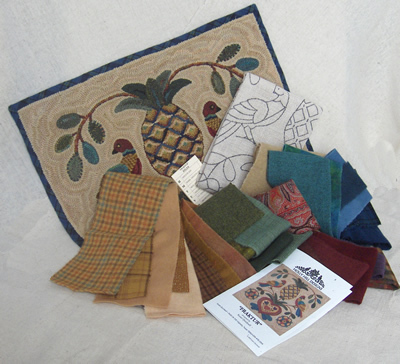 Complete Kit includes hand-drawn 28” X 41” pattern on Scottish Linen and hand-dyed and as-is wool textures in 40 colors (not pre-cut strips) for motifs in shades of greens, teals, golds, rusty-reds, blues and neutrals. Background is hand-dyed green-black mix for textural effect. Unique "2-color bead-like" checkerboard border with instructional diagram. Wool swatches are labeled to match step-by-step hooking directions, with accompanying motif close-up photos, in the detailed Directions Brochure. Optional hooking techniques such as “2-color Beading” and “End-to-End Tunneling” are described in Brochure. #6-#8-cut strips recommended. 28” x 41” linen pattern & wool, labels for wool swatches, close-up color photos, and steps-by-step directions to hooking each motif. A Great Beginner Project! 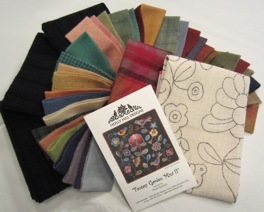 The Complete Kit includes hand-drawn 16” X 20” pattern on Scottish Linen, hand-dyed and as-is wool textures in 25 colors (not pre-cut strips) for backgrounds and motifs in shades of greens, teals, golds, reds, and pinks. Wool swatches are labeled to match step-by-step hooking directions, with accompanying motif close-up photos. 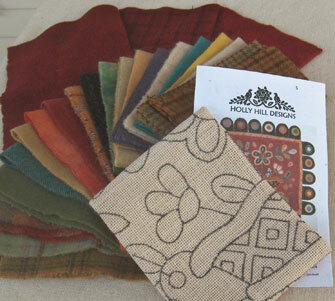 The 6-page Directions Brochure includes finishing directions for finished corded edge using wool strips. 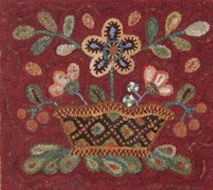 The optional hooking technique of “2-color Beading”Is described. #7-#8-cut strips recommended. Complete kit includes hand-drawn 20"x 20" pattern on Scottish Linen and mostly hand-dyed and as-is textures in 36 colors (not pre-cut strips) for motifs in shades of green, teal, turquoise, gold, red, orange, blue, and purple. 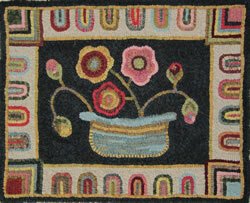 Background is a dark tealy-black mix for a rich, textural effect. Wool swatches are labeled to match step-by-step hooking directions, with accompanying motif close-up photos in the 6-page Directions Brochure. Hooking techniques such as "2-color beading", "end-to-end tunneling" and Waldoboro sculpting" described. #5, #6, #7-cut strips recommended. 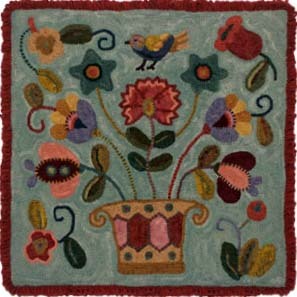 Complete Kit includes hand-drawn 16" x 20" pattern on Scottish Linen and hand-dyed and as-is wool textures in 30 colors (not pre-cut strips) for motifs in shades of coral, gold, green, aqua, blue, red, brown. 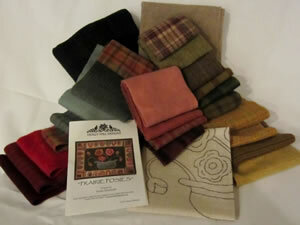 Wool swatches are labeled to match step-by-step hooking directions, with close-up photos in 6-page Directions Brochure. #6-8 cut strips recommended. Complete kit includes hand-drawn 20"x 20" pattern on Scottish Linen and mostly hand-dyed and as-is textures in 32 colors (not pre-cut strips) for motifs in shades of teal, turquoise, peach, green, gold, pink/rose, indigo, purple, lavender. 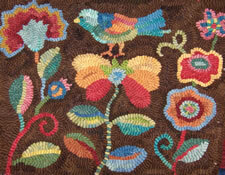 Background is one of Susan's custom colors, a hand-dyed aqua-blue mix. Wool swatches are labeled to match step-by-step hooking directions, with accompanying motif close-up photos in the 6-page Directions Brochure. #6 - #8-cut strips recommended. Please copy and past this email into your mail program.